Camping is a no-brainer. I got a cozy camper, good food, and everything I need just a few steps from the music. Way better than driving each night! Our kids love camping each year. We bring yard games and the grill and make the most of family time each day while we're waiting for the bands to start. Q: When do quiet hours start? A 2:00 a.m. curfew will be enforced in all campgrounds. Loud music, parties and anything that disturbs neighbors or other campers will not be tolerated. We do not expect total quiet, but please respect your fellow campers. Generators must be shut off at 2:00 a.m.
A Standard Campsite or VIP Campsite is 20′ x 40′, while a Luxury Campsite is 40′ x 40′. Each campsite allows for one sleeping unit and one steering mechanism. All vehicles and camping equipment must be able to fit entirely into your spot. There must be a five-foot separation of all trailers due to county regulations (two-and-a-half feet from the rear and side borders). You will be asked to move your vehicle if there is a question of space. Yes, showers are free and available near the arena. Open flames of any kind are prohibited in all campgrounds. Generators are allowed but must be turned off by 2:00 AM each night. If you have an onboard generator, consider buying a generator exhaust kit (like this one) to route the CO2 out of your own and surrounding campsites. Generators must be separated from all sites by a minimum of 20 feet and protected from contact by fencing or other approved means. Q: Where are the various campgrounds located? Check out our festival map to see the location of each campground. Depending on the campsite you purchased, a walk to the venue could range from 2 to 15 minutes. No outside food, beverages or alcohol are permitted on festival grounds. Outside food, beverages and alcohol are only permitted in the camping area. 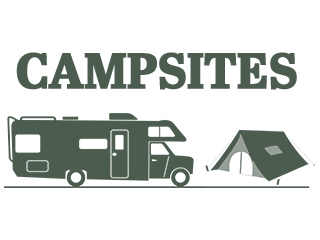 Campsites are 20′ x 40′ (excluding Luxury Campsites that are 40′ x 40′ and allow for one camper and one vehicle OR one motor home OR multiple tents and one vehicle (one sleeping unit and one steering wheel). All vehicles and camping equipment must be able to fit into your spot. There must be a five-foot separation of all trailers due to county regulations (two-and-a-half feet from the rear and side borders). You will be asked to move your vehicle if there is a question of space. Additional vehicles will be charged a parking fee for the weekend and will be required to park in a separate overflow parking area. Overflow parking passes may be purchased in advance or at the festival. Security is provided by Jefferson County Sheriff’s Department and Country Jam Security.